There is a world of streaming devices out there to enhance your viewing and entertainment pleasure. The question is what one is the right one for you? Well, I have been on a mission to try and make the world of streaming devices a little less confusing for my fans. So the streaming device that I have been putting to the test is the Roku Streaming Stick. The new Roku Streaming Stick delivers powerful streaming – it’s the only pocket-sized streamer available with a quad-core processor. With 8x the processing power of our 2014 Streaming Stick, the new Roku Streaming Stick gets you to your favorite shows fast, with smooth and responsive navigation and channels that launch quickly. Get the entertainment you love and the choice you deserve with easy access to Netflix, Google Play, Cineplex, NGL, and 2,000+ more channels delivering 100,000+ movies and TV episodes. What you should know: A paid subscription or other payment may be required to access some channel content. Channels are subject to change and vary by country. Never miss an episode. Move your Streaming Stick® to different HDTVs in your home or take it to a friend’s house. Plus with Hotel & Dorm Connect* you can stream away from home – even when a wireless browser-based login is required. Just use your Roku remote and your smartphone, tablet or laptop with a web browser to connect your Streaming Stick®, sign in and start streaming! *See full requirements: Hotel & Dorm Connect support. Save time and money with unbiased search across top channels. Find movies, TV shows, actors, and directors. Discover where movies and shows are free or cheapest to watch with search results ranked by price. Search with your remote or by voice with our free mobile app, available on iOS® and Android™. Use your own headphones with your iOS or Android smartphone or tablet to listen to the content playing on your Streaming Stick. Get lost in streaming entertainment while keeping things quiet for everyone around you. Connect your new Roku Streaming Stick to the Roku Mobile App, and then watch what you want, when you want, as loud as you want. It even supports most Bluetooth headphones and speakers! When my Roku Streaming Stick arrived, I had it set up in no time flat. I just had to plug the streaming stick into the HDMI on the back of my television. Then just put the included batteries in the remote and we were ready to go. We all really enjoyed going through all the available entertainment channels on the Roku Streaming Stick and marking our favorites. There are so many entertainment channels and a ton of them are Free. Yep Free! Of course there are the usual ones that people are familiar with, such as Netflix. We have a subscription to Netflix, so we put that channel under our favorites. So why am I happy with my Roku Streaming Stick? There are a ton of reasons…. Here is one big reason that I love the Roku Streaming Stick…..quality. We used to run our Netflix through the smart blu-ray player that we have. It was always freezing, having trouble loading the movies, and losing connection. We were beyond frustrating. Well, since we stream Netflix through our Roku Streaming Stick, we have not had one single issue with our Netflix. It is enjoyable again to watch Netflix. A common question is do I need a Roku device for each television and the answer is yes. Having said that, the Roku Streaming Stick is portable and can be moved to different televisions in the house. Personally, I find the Roku Streaming Stick affordable and think it is more convenient to have a Roku Streaming Device for each television. If you have more than one Roku Streaming Stick, you can link them all to your one Roku account so that all your streaming sticks are synced. We are very excited with our Roku Streaming Stick. We love all the channels we have now. There are amazing channels for every interest. 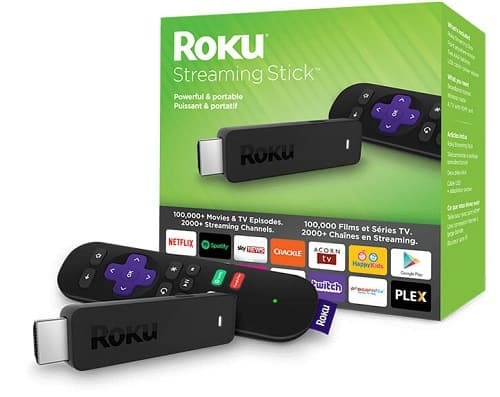 There are also the well known channels such as Google Play, Cineplex Store, Cinema Now, YouTube, GoPro, NHL, Sesame Street Go, Snag Films, and Spotify, just to name a few from the over 2000 channels available on the Roku Streaming Stick. The bottom line on the Roku Streaming Stick is that everyone in my family loves it. It is an all in one entertainment solution for the entire family. We love, love, love our Roku Streaming Stick. I highly recommend you check out the Roku Streaming Stick. You can find out more about the entire series of Roku products, including the Streaming Stick here…. I am excited to announce a giveaway for one Roku Streaming Stick. This giveaway is open to residents of Canada over 18 and where permitted by local laws to enter and win giveaways. Please ensure that you read the full terms and conditions found at the bottom of the entry form. I am most excited about Netflix! I am excited for Cinema Now. I like the Roku Streaming Stick is portable, then I could watch my programs where I want to. Netflix would be wonderful to watch! I would be happy to have Netflix on my older tv that isn’t smart. I am most excited about Netflix. Right now I watch it on my computer because I do not have a streaming device to play it on my television. I am not sure why that is happening. I’m excited about Cinema Now. I am most excited for Netflix! I am super stoked about the Netflix channel.It has a wide selection of amazing things to watch. The Ciniplex Store is a close second for me.It sounds great too. I am definitely excited for Netflix! Netflix and the NHL channel! I am excited for Inside Out! I am most excited for Netflix. I am most excited for Netflix (followed very closely by the CinePlex store)! Thanks for the chance. I’m most excited about the free movies, so much to choose from, other than just being stuck with one company!! first I heard of these but I imagine it’s not hard to use! !